Imagine having a friend that demonstrated love to you even when you were most unlovable. Someone that was ALWAYS available no matter what time it was, morning, noon or night, weekday or weekend. Someone that knew you deserved to be punished for some of your actions yet took the punishment for you. 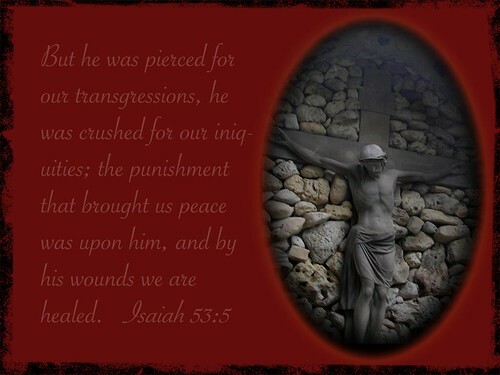 Someone that was willing to be beaten, scourged and even killed so that you could have freedom! Imagine that this friend never refused to take your calls or ever responded with, “I’m too busy right now can you try me again later.” Someone that you could put your trust in 100 percent and they would never hurt you or abandon you. Someone that when you did put that trust in, would perform miracles when necessary on your behalf. That would not only help you whenever you needed it but when you would mention others needs to them they would resolve them too just for you and your trusting them to come through! A friend that would hold you accountable to a higher standard of living and give you the power to accomplish that. A friend that would intervene gently when you were about to make a big mistake in life that could cost you greatly or intervene firmly when you needed a kick in the pants to get you back on the right track. Someone that would promise and follow through walking alongside you during every high and low period of your life and would even give you joy while you went through the low periods. It’s hard to imagine why anyone would refuse to have a friend like this ..but sadly millions do. They reject the one who offers all of the above and more. I will never regret accepting Christ and welcoming Him into my life. He has NEVER disappointed me. He has NEVER allowed me to go through anything I couldn’t bear going through with Him alongside me. He gives me joy that allows me to have full confidence in my future no matter what the circumstances. He’s replaced my anxiety with peace! That alone has been monumental in my life. He gives me guidance and direction whenever I ask Him. He provides wisdom when I need it. He has answered so many of my prayers over the years that it is impossible for me to even mention them all. He has brought amazing people into my life and has given me a love for others that in the natural would be impossible. I have no doubt He will continue to provides direction for the coming days when prophetically things will become increasingly difficult. John 10:10,11 NIV 10 The thief comes only to steal and kill and destroy; I have come that they may have life, and have it to the full.11 “I am the good shepherd. The good shepherd lays down his life for the sheep. Isaiah 9:6 NIV 6 For to us a child is born, to us a son is given, and the government will be on his shoulders. And he will be called Wonderful Counselor, Mighty God, Everlasting Father, Prince of Peace. Phillipians 2:5-7 NIV 5 In your relationships with one another, have the same mindset as Christ Jesus:6 Who, being in very nature God, did not consider equality with God something to be used to his own advantage;7 rather, he made himself nothing by taking the very nature of a servant, being made in human likeness. Hebrews 4:15,16 NIV 15 For we do not have a high priest who is unable to empathize with our weaknesses, but we have one who has been tempted in every way, just as we are —yet he did not sin. 16 Let us then approachGod’s throne of grace with confidence, so that we may receive mercy and find grace to help us in our time of need. If you don’t have Christ as your friend the solution is easy and can be found in the next few verses… Romans 5:8 NIV 8 But God demonstrates his own love for us in this: While we were still sinners, Christ died for us. Romans 10:9 NIV 9 If you declare with your mouth, “Jesus is Lord,” and believe in your heart that God raised him from the dead, you will be saved. Amazingly simple and amazingly profound..He will be a friend like no other!